Description: 007 3GP Video Converter can convert all popular video formats to various mobile supported formats like 3GP, 3G2 and MPEG-4. It is convenient and simple to use. 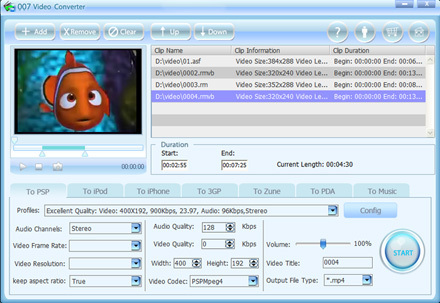 The 007 3GP Video Converter supports all most of formats on the internet such as AVI, WAV, MPEG, RM, DIVX, MOV, ASF, etc. Description: 007 PSP Video Converter can convert all video formats to PSP movie and music. It is really easy to use for novices and professionals. 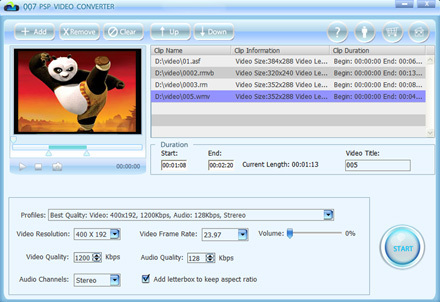 The 007 PSP Video Converter supports all most of formats on the internet such as AVI, WAV, MPEG, RM, DIVX, MOV, ASF, etc. Except for that, it also can convert these videos to audio files such as PSP AVC, MP3, WMA, PSP MPEG- 4, etc. Description: 007 Video Converter is incredibly easy to use for both novices and pros alike, 007 Video Converter has all the capabilities to give you a product with outstanding quality. Convert videos of all popular formats like AVI, MPEG, WMV, DivX, MP4, H.264/AVC, AVCHD, MKV, RM, MOV, XviD, 3GP, etc, transform between MP3, WMA, WAV, RA, M4A, AAC, AC3, OGG audios, and create fascinating videos from photos. 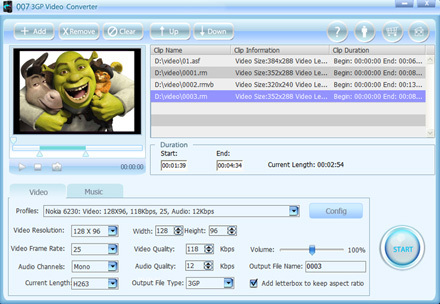 Description: Professional DRM converter and universial media converte, convert DRM-protected and non-protected audio and video files into common formats including WMA, WAV, WMV, M4A, M4P, M4V, AAC, M4B, 3GP, AVI, etc, removes DRM protection legally from video file by separating the original video from DRM, the batch conversion mode promises 4x faster conversion speed with unmatchable output quality, supports output effect editing. Description: DVD to 3GP Converter is powerful DVD to mobile phone software. It allows users to rip DVD movie to 3GP, 3GPP for playback on all kinds of mobile phone, also can help you rip audio signal from DVD to MP3, WMA, WAV, etc. Benefit from the powerful decoder. You can easily convert all kinds of DVD to mobile phone including Nokia, Motorola, Sony Ericsson, iPhone, Samsung, LG, Smart Phone, PDA and other brand phone. Description: DVD to iPod Converter is the easiest-to-use and fastest DVD to iPod converter software for Apple iPod Movie and iPod Video. It can convert almost all kinds of DVD to iPod Movie / iPod Video format. It is also a powerful DVD to iPod converter due to the conversion speed is faster than real-time. And the output iPos movie/video supports iPod screen, you can enjoy your favorite DVD on your iPod as a portable DVD Player. Description: DVD to MP4 Converter is great easy-to-use DVD to MP4 converter software which helps you convert DVD to MP4 (MPEG-4), H.264, DVD to DivX video for all MP4 players like Archos AV500, Archos AV700, Archos GMini402, iRiver PMP-100, Creative Zen Vision, iPod, PSP and other MP4 players.With DVD to MP4 Converter fully support,you can rip DVD to MP4 with great stabilization, it provides super fast speed for ripping DVD to MP4 format.